BEIJING, Oct. 26 (Xinhua) -- Xi Jinping was Wednesday re-elected general secretary of the Central Committee of the Communist Party of China (CPC) by a unanimous vote at the first plenum of the new Central Committee that was elected at the party's twice-a-decade national congress. 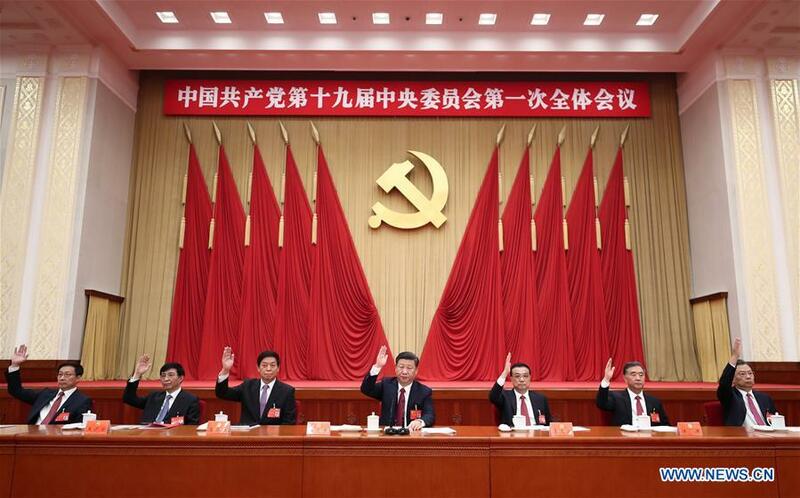 The plenum also elected the members of the Political Bureau of the CPC Central Committee and its Standing Committee. Based on the nomination of the Political Bureau Standing Committee, it endorsed members of the Secretariat of the CPC Central Committee, and decided on members of the CPC Central Military Commission. It also approved the election of the secretary, deputy secretaries and members of the Standing Committee of the 19th Central Commission for Discipline Inspection (CCDI). Starting from early 2017, Xi began seeking advice from other members of the Standing Committee of the Political Bureau on how to deliberate and determine candidates for a new central leadership. On April 24, the Standing Committee of the Political Bureau held a special meeting which was presided over by Xi and adopted a plan on the recommendation of candidates for the central leadership. Candidates should have firm faith and be loyal to the CPC, and keep a "high degree of conformity with the CPC Central Committee with Comrade Xi at the core," according to sources close to the central leadership. They should have outstanding leadership abilities, be a veteran in practice with the determination to push forward reforms and innovation, take a lead in implementing democratic centralism, and be an impartial and upright person with a communist outlook on the world, life and values. In late May, a provincial leader was summoned to Beijing for a talk in Zhongnanhai, the exclusive compound for top leadership. This official then had a one-on-one session with a senior leader about recommendations on candidates of the new leadership, after studying the name lists of then incumbent leadership and ministerial/provincial leaders. There was no limit to the recommendations, according to the official. This is one example how one-on-one talks were included in the recommendation of candidate leaders for this first time. From April to June, Xi personally talked to 57 senior leaders and retired leaders to seek their suggestions. Other senior leaders also did one-on-one sessions with 290 ministerial cadres and senior military officers. During the one-on-one sessions, several senior leaders voluntarily offered not to seek reappointment to make room for younger comrades. Sources close to the central authority said the new top leadership marks a new beginning and fully demonstrates the contemporary morale of the CPC.